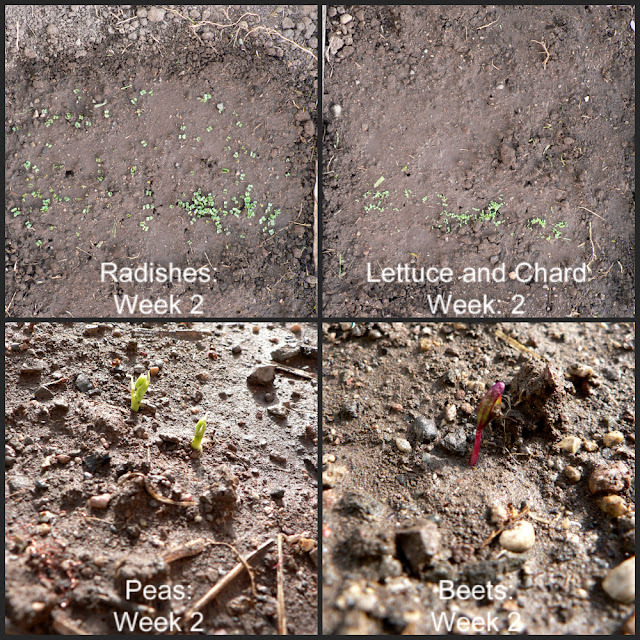 I had a friend email me this week and ask a few garden questions. I realized, through her emails, that I have gained a lot of knowledge about gardening over the years. I gardened with my dad as a kid and have had a garden every year of married life. I guess I have done it for a while! It’s something I love, so why not blog about it too. Did you know that there are some vegetables that you can plant as soon as the soil can be worked? 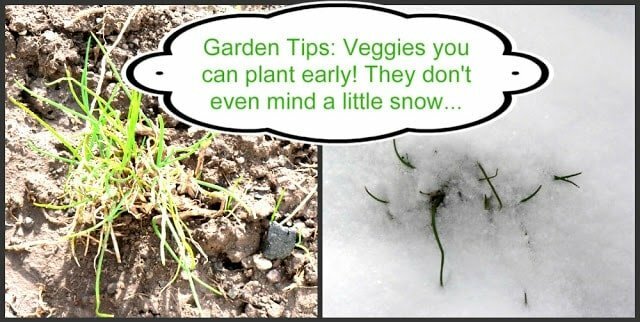 This means you can plant as soon as you can dig; you’ll know if the ground is still frozen if you can’t scoop up a shovel full of dirt. 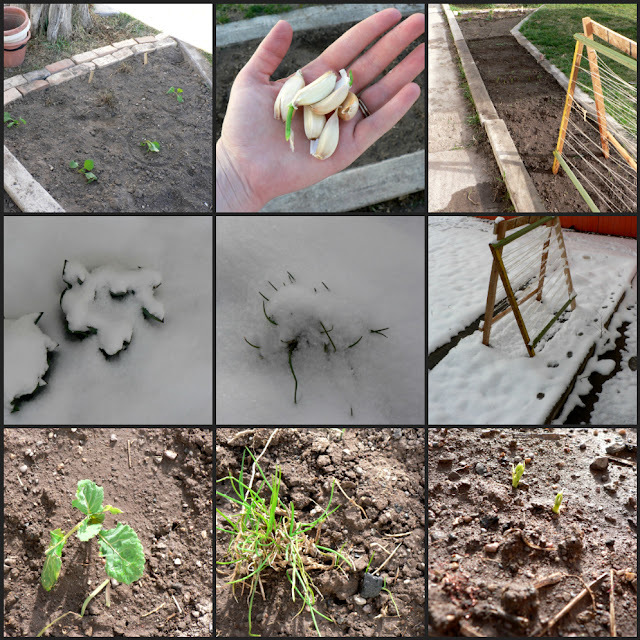 I was pretty ambitious this year and planted my cold hardy vegetables 2 weeks ago. I haven’t talk to anyone else that has though, so if you think you’d like to, do it! Another great thing about vegetables that you can plant this early is that they are hard to kill. If they can stand up to snow, they can stand up to your lack-of-a-green-thumb too. Cold Hardy Vegetable Garden it is! I plant a garden for a few reasons: it’s a huge money saver, I love vegetables (and homegrown taste best), and it’s a skill I think important to develop. Money saving: With a few dollars worth of seeds you can produce pounds and pounds of produce. I don’t buy pesticides, weed-killer, or fertilizer; they all add to the cost (and I like a more organic approach myself). I work the soil and weed by hand, and I compost my kitchen scraps to use as fertilizer. This is the first year I have my own compost to use. In past years I bought compost from the city which is incredibly inexpensive. Provo City uses collected yard waste and Christmas trees to make compost and it costs $15 per cubic yard, which is a little less than a truck bed full. You may not need this much so go in on a load with neighbors. Contact your local city waste management department to see if they do something similar. The money savings are extended when I can or bottle the extras to save for later. Canning is a lost art! It’s not hard to do although it is labor intensive. The satisfaction of seeing food preserved is something you won’t understand until you do it. It’s ridiculously rewarding. I plan on posting about canning as I do it this year, so we can learn together. Be on the hunt for those big old pots to can in and start asking the older ladies you know if they have supplies for it. I have borrowed and still borrow different supplies that I haven’t collected up yet. Every old lady I have talked to about canning and borrowing was more than willing and even excited to pass on and make available something that they love and did as young mothers, too. Be excited! Canning rocks! I freeze lots of things too, so don’t be sad if you don’t want to can. Vegetable Love: Even if you don’t love vegetables there are probably a few you do like. Plant those. I like gardening because it gives me a chance to try vegetables that I don’t buy (orange cherry tomatoes anyone?). Cooking when a garden is on is the best. You can’t let those veggies go to waste, so you use them! Fresh herbs are exciting, too. They taste amazing but I don’t like to commit to a whole package of fresh sage if I only need a little for one recipe. I just grow my own and pick what I need; problem solved. Let your herbs and vegetables inspire your dishes. I often find new recipes based on an herb or vegetable I want to use. It’s a fun way to get out of your cooking comfort zone. And here’s my honest opinion – if you think you don’t like a vegetable, you just haven’t had it prepared right. Roasted beets with butter and salt are divine. Hands down. Good Skill to Know: If gas prices continue to climb or our economy bites the dust (more than it already has), I don’t want to depend on a grocery store to feed my babies. Sure, I can eat the wheat and beans I have stored under my bed, but knowing how to plant, care for, use, and store a garden could really be a life saver. Really. It might save your life. Now, it probably won’t, but I’d rather be prepared than hungry. That’s just me. Are you convinced? Good, now let’s get you started! Vegetables don’t care if your garden is big, little, in a pot on your balcony, or in your “flower” bed. They need water, soil, and sun. Plan on at least 6 hours of full sunlight a day when deciding where to put your cold hardy garden. Full sun all day long works, too! I have found that leafy green plants like spinach, chard, lettuce, and kale will last longer into the summer heat if they have some shade in the afternoon. I live in the dessert and it gets hot. They don’t tolerate heat well; it makes their taste go bitter. So I like to plant this kind of vegetable where they can get some reprieve from the sun. Plan on working the soil well! I dig and dig, pull out grass and anything that isn’t dirt, and then dig and dig some more. I probably spent 10 hours getting this little garden ready. That is a lot of time, but my plants will grow better in the end. Now, you can use a little tiller if you have access to one and that would save you gobs of time. I am almost positive that you can rent one (by the hour) from Home Depot, too. I was removing full on grass from the area so it was a lot of work. If the dirt is hard for you to dig, then it will be hard for plant roots to grow in. Dig, fluff, turn over, and dig some more until the dirt is uncompacted and workable. You might need to add some sand or “top soil” (sold in bags at the store) if your soil is in bad shape or has lots of clay in it. Throw some seeds where you want them, pat them down with your hand and rake some dirt over them (the seed package will tell you how much). Now all you need to do is keep them watered. So, are you going to plant some peas?!? 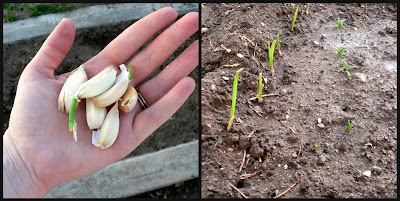 One of my goals for the year is to plant garlic. I don’t know much about growing it, but some of my garlic from the store started sprouting on my counter. I threw them in the ground and they are growing. We’ll see how it works! The library is a great place to get gardening books. I recommend checking out a few if you are interested. I love The Backyard Homestead by Carleen Madigan because it has lots of pictures. I am a pie charts and diagrams kind of woman. It’s a great starting point. Questions? Comments? Concerns? Now get crackin’! so it looks like you covered some stuff when it snowed? also, I hope for a follow-up about how to thin. I covered the cabbage plants up because of wind! It’s so shockingly windy here; I thought they were going to get ripped out of the ground. It snowed and was really cold (like 20 degrees) last night, nothing was covered, and everything looks to be recovering. I was a little worried, but things are looking good! My kids are pretty good about not picking things. We have a rule though (for under-ripe things like green tomatoes) if you pick it, you have to eat it. A few bites of my onion tops and sour green tomatoes usually helps them to leave it alone. I hope you get squash this year, they are so good! and, do you have problems w/your kids pulling up your sproutlings? michael did that to all of our squash last year. we have never successfully yielded anything from the squash family.